Protect your Good Book with this high quality leather cover. Designed with pockets to hold small necessities. Praise the Lord Bible Cover made of soft lambskin leather in black. Main zipper opens on 3 sides. Padded main compartment for Bible. Two front pockets, one w/ zipper.One w/ flap. Nylon lined on the inside includes built-in bookmark. Dimensions: 6" x 9" Medium size Fish logo debossed on front. Leather Handle on top edge. 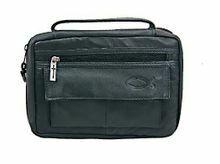 This bible cover looks good, protects its contents, has extra pockets to keep your ancillary items organized, is durable and will last a long time. This leather cover makes a great gift for family, loved ones and friends.